Next I wore one was in my last year of college. 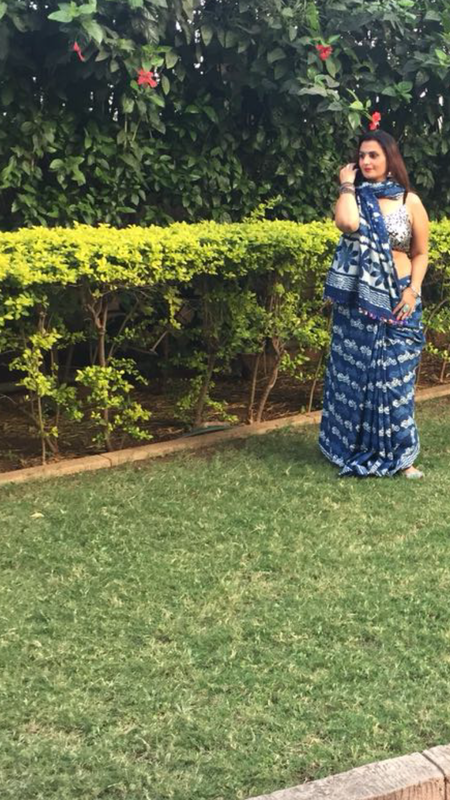 Yes, I barely wore any ethnic stuff, even till after I got married. Silly notions that I did not look good. But, by the time I reached my college farewell I was more clued up and yeah it was also the fashion hub – Delhi from where I graduated, so keeping up with trends came naturally. This time it was a carefully selected black mokash work, again from my mom’s closet. Add to that a sleek blouse and I felt nothing less than a diva. 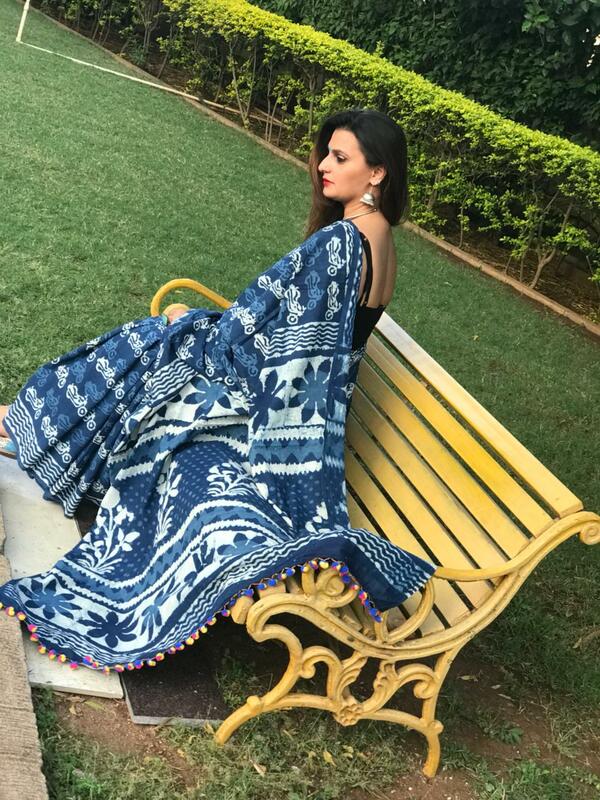 Years later, it is a new me who is crushing on sarees and spending a considerable time on Instagram trying to source some stunning pieces. Face palm. So my latest entrant is a gorgeous cotton one from Rukmini by Balaji Creations. 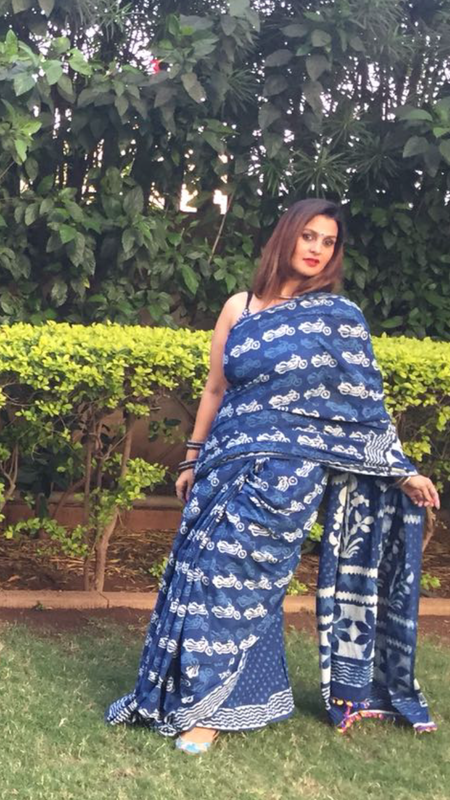 It is an indigo blue with vintage bike print all over it. I love the vintage look attached to the saree and since I have a husband and son, both obsessed with bikes, I thought may as well join the bandwagon. The fabric is soft cotton and easy to drape. It has a running blouse fabric, however I teamed it with a black and silver sports bra. Yeah, that is my weird element right there. I kept my make up simple – heavy kohled eyes and a bright red lipstick. A light eye shadow and blush so that my skin did not look pale. Sharing some pics, hope you like them. The prints are so nice.